Historians have often asserted that the city of Chandigarh is the first city in the country that was properly planned which renders the city a unique and distinct architectural grammar. The city owes its brilliant designer to an architect from France named Le Corbusier who planned this beautiful city in a space of 56 square kilometers. Popular for its exceptional design, Chandigarh is often hailed as the most planned city in the entire nation. The meticulous planning and exceptional grace of the city lends the city a well deserved title of “THE BEAUTIFUL CITY”. The city of Chandigarh lies right of the Shivalik Foothills that give the city a natural temper of beauty. Eucalyptus and Banyan trees border the city from every side. Cassia, Asoka, Mulberry etc are some of the many species of plants found in this region. The adjoining forests areas of the city boast of dense forests which is a habitat to several species of plants and animals. Sambars, Deers, Barking Deers, Woodpeckers, Peacocks and Parrots are all residents of these forests. Acting as one of the strongest tourist magnet in the northern part of India, Chandigarh till today boasts of its magnificent monuments. A visit to the city is futile without looking at these exceptionally beautiful monuments. With a pleasant weather all thoughout the year, the city of Chandigarh is always flocked by tourists. One of the greatest works done by the French architect Corbusier, Capitol Complex is undoubtedly one of the grandest places in Chandigarh. The Capitol Complex is the operating space for Punjab and Haryana’s government. Lying beneath the huge range of the Shivaliks, the Capitol Complex has three main places – the High Court, the Legislative Assembly and the Secretariat. The French designer, Le Corbusier designed this place to allow gatherings of general masses to discuss the various social and civil issues. He had meticulously planned its overall designing of this architectural marvel. It was hence thought that this place would serve as the centre of social change that would be initiated by the locals of the city for the improvement of Chandigarh. The hand also is made up of the colors of the Indian National Flag and serves as the emblem of the city of Chandigarh. The Open hand Monument is designed in a free way that would also show the direction of the winds. On the right hand side of the Assembly Building stands the Martyr’s Memorial which is a monument that dedicates itself to people who lost their lives during the blood filled partition of India. The complex also houses a number of metaphorical symbols that grace the interiors like the, Lion and a snake that stand majestically amidst the ruins. 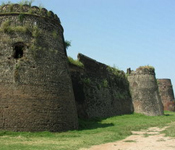 Lying at a small distance from Chandigarh lies the majestic Nalagarh Fort which stands on a hilltop in the Shivaliks. 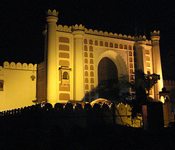 Serving as a luxury resort, the Nalagarh Fort was constructed during the rule of the royals of Nalagarh. Turned into a hotel, the fort is bubbling with amenities of the modern day. Nalagarh served as the capital of the Hindur Kingdom which was established in 1100 A.D by Rajai Ajai Singh. 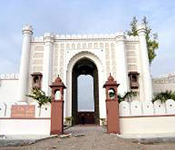 The place was governed by the Rajputs of Chandela who contributed heavily in the patronization or Art in general and Architecture in particular. The Final Ruler of Nalagarh was Raja Surendra Singh who is succeeded by Raja Vijeyandra who is anointed ceremoniously.